FAST Company’s Innovation Festival is an annual event in New York City that draws around 10,000 tech and other entrepreneurs internationally. The format is conference style with keynote addresses, panel discussions, and hands-on workshops along several content tracks, including design, technology, leadership, creativity, healthcare, retail, etc. Thanks to Bob Safian, editor of FAST Company, Cambridge Global Advisory (CGA) was offered the opportunity to participate in this year’s festival. The task at hand for our senior advisor, Faisal Afzal, was to make use of his time most effectively to maximize learning and see examples of how others across industries approach innovation and problem solving. Faisal walked away firmly believing this event is a must for wherever you fit in the organization. Also, you do not have to be an entrepreneur or have an entrepreneurial mindset to attend this festival. The level of energy, creativity and thought provoking discussions he experienced first hand can be effectively leveraged to drive innovation within any organization. In fact companies should consider providing access to this festival as part of their education benefits. Goldman Sachs’ Marcus initiative, launched just a year ago is geared towards an online consumer lending solution. 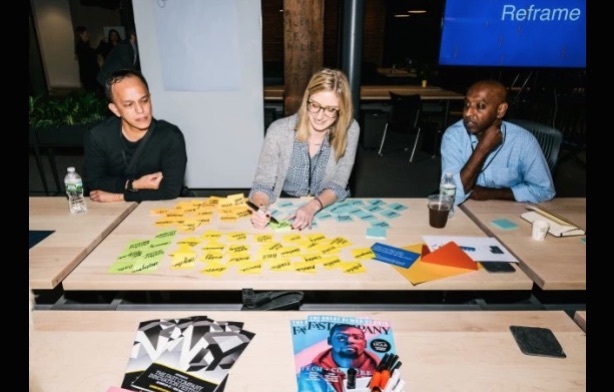 The session featured Omer Ismail, CCO, and a few members of his team who discussed how the culture of innovation got its start at Goldman Sachs with this new effort. FAST Company’s excursion on day one, took Faisal to West Elm in Brooklyn, and gave us an opportunity to learn from Jennifer Gootnam, VP Social Conscious & Innovation and Doug Guiley, SVP Global Sourcing. They discussed how they have included Fair Trade to make meaningful social impact and how it is never too late to make social impact part of your company’s strategy and vision. In West Elm’s case social responsibility and the impact was not just an aftermath of success but inherently designed to assist and help where it is needed the most in uplifting communities and workers. Faisal heard from co-founders of Shine, Naomi Hirabayashi and Marah Lidey. Shine is a messaging application that delivers daily motivational messages to their customers on their chosen messaging platform. With over half a million subscribers and VC funding, they are focused on helping their subscribers “normalize tough experience” through meaningful and encouraging messages to help improve wellness. Faisal also met and heard from Glenford Prospero, Director of Integrated Digital & Innovative Instruction at De La Salle Lipa, a school in the Philippines. Glenford is not just working on providing innovative solutions in the classroom but leveraging the same mentality and set of solutions to drive social inclusion and justice initiatives in the country. CGA’s research advisors and contributors, Naziha Hassan and Jeffrey Harvey’s contributions on the rise of Experiential/Social Marketing and utilization of “Pop Up” retail model became part of the discussion held with Bonin Bough, CNBC’s host of Cleveland Hustles, Tina Sharkey, Founder/CEO of Brandless, and Dan Clay, Senior Associate at Lippincott Brand Strategy & Design. CGA’s outlook was right in line with this panel‘s views. Over at United Technologies Corporation (UTC), Faisal heard from Steve Serra, VP of Product and Innovation, and his teams discuss how they turn constraints into opportunities to drive creativity and innovation. UTC kept it engaging with a two-way dialogue and asked us to participate in utilizing their problem-solving framework to present solutions. Faisal sat in on a discussion with Jayshree Seth, Corporate Scientist at 3M, Jeremy Fryer-Biggs, Founder/CTO at Evaptainers and others at 3M working together to provide innovative solutions for rural and disadvantaged communities – case in perspective: zero energy refrigeration solutions for the developing world. CGA is following up with Jeremy to see how we can partner in this endeavor to strengthen our commitment to helping communities. How do you not come out of an event like this motivated to find innovative solutions! Of course, we have to thank our host, FAST Company, Bob Safian, Rich Bellis and the countless other staff, facilitating an incredible learning environment for those who participated. ← Will Amazon’s “Pop” Into Retail Mean Opportunity For Tech Vendors?